No need to peel baby eggplant, the skin is tender and thin. Use any leftover eggplant and sauce to top a grilled portabello mushroom or a cold slice of tomato. In a small bowl, stir together yogurt, water, 1/4 teaspoon salt, cumin, garlic and paprika; set aside for at least 10 minutes for flavors to blend. Preheat grill or stove-top grill pan to medium-high. Slice eggplant lengthwise into 1/2-inch-thick slices; coat with cooking spray and sprinkle with remaining 1/2 teaspoon salt. 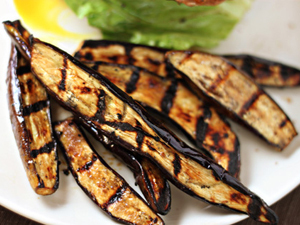 Grill eggplant until lightly charred and tender, turning as needed, about 8 to 10 minutes; remove to a serving platter or bowl. Spoon yogurt sauce over eggplant; sprinkle with mint and garnish with paprika. This entry was posted in Entrees, Metabolic Medical Center Recipes, Modified Profast (Fast and Flexible) Recipes, Nutriplus Recipes (Balance Your Pyramid), Uncategorized, Vegetables and tagged Cooking spray, eggplant, Fruit and Vegetable, garlic, grill, main dish, one dish, side dish, Vegetable, vegetarian by foodies4mmc. Bookmark the permalink.